I took today off to catch up after travelling for the weekend. I had some errands to run so I thought I'd do something I've never done on a day off and running errands -- wear a coat and tie! What a goofball, eh? The funny thing is I'll probably do it more often since I seemed to be treated better and more people smiled and said hello. Maybe I smiled more? Today's bricolage (thanks to Knot a Blog for the new terminology) consists of a very simple combination. The dress shirt is a white, spread collar pinpoint. If it's simple then it must be the navy sport coat. 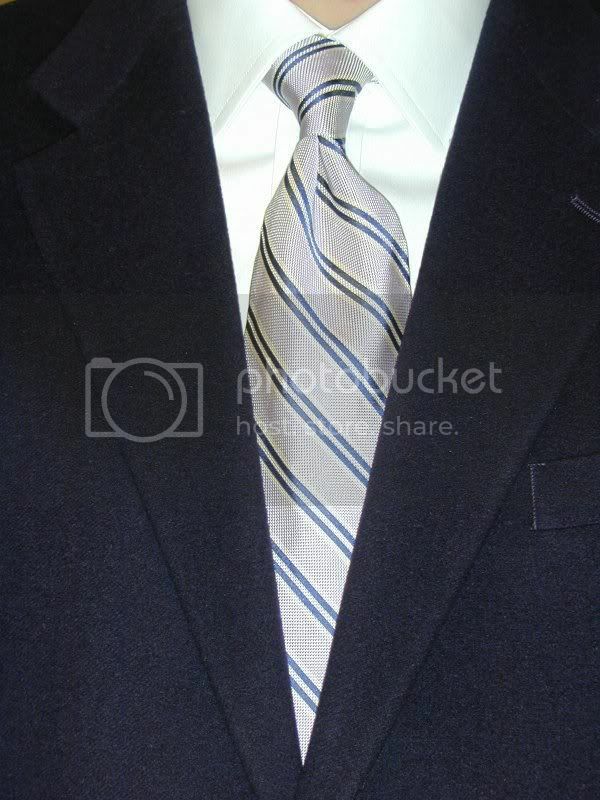 The necktie is a regular Jos A. Bank with a lavender background with white and navy stripes. I've had the tie for a while but today is the first time I have worn it. The lavender color reminds me of the lilacs that line one side of my back yard. One of my favorite times of year is when they finally blossom and fill the air with their scent. They only last two weeks or so which makes it even more special when they are in bloom. If they lasted longer then there would be the risk of growing less than fond of them. I guess I must be getting a bit impatient so I substituted the tie for the lilacs. Not a great substitution but it'll do. I've recently added two other necktie bloggers to my links. I've mentioned Burl Veneer before and today I get to officially welcome Michael from Knot a Blog. Be sure to check out Michael's blog because he, like Mr. Veneer, goes into great detail about his neckwear. Both of these gentlemen prefer more interesting patterns than I do. That's what's great about ties -- it's the one place in a man's wardrobe that he gets to show a bit of himself. I just noticed I had only saved this as a draft rather than publishing it. Ooops!